PhD Thesis - "Smart sensors with internal model and fuzzy techniques" at Politehnica University of Timisoara - 2003. Director of thesis Prof.dr.ing Mircea Ciugudean. 3. Foreign languages: English, French. •	Organizer of special session Soft Computing Applications, http://www.rasc2006.org.uk/ The 6th International Conference on Recent Advances in Soft Computing, RASC 2006, 10-12 July, 2006 Canterbury, University of Kent, UK. 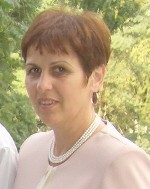 •	Organizer of Section 3, Engineering Process and Technology, Electrical, Mechanical and Textile Engineering at International Symposium Research and Education in Innovation Era, 16-18 November, Arad, Romania, 2006. •	Organizer and member of the Editorial Board of Series Electric Engineering, Electronics and Computers of the Scientific Sessions of Aurel Vlaicu University of Arad in 1996, 1997, and of the University Anales from 2000, 2002, 2004 and 2006. •	Editor-en-Chief of Scientific and Technical Bulletin, Series: Electrotechnics, Electronics, Automatic Control and Computer Science, of "Aurel Vlaicu" University Arad. •	Editor of Proceedings of the 7th WSEAS International Conferences: Neural Networks, Fuzzy Systems, Evolutionary Computing, Accoustics & Music:Theory and Application, Mathematics and computers in Biology and Chemistry, Mathematics and Computers in Bussines and Economics, Automation and Information, 2006, Cavtat, Croatia. •	Guest Editor at Wseas Transactions on Information Science and Applications, Issue 9, Volume 3, September 2006. •	Guest Co-Editor to book, Springer Verlag: "Soft computing based modeling in intelligent systems", in Studies in Computational Intelligence (Editor-in-Chief: J. Kacprzyk) in preparation. •	Member in Editorial Board of International Journal of Intelligent Decision Technologies,	ISSN: 1872-4981, IOS Press, Nieuwe Hemweg 6B, 1013 BG Amsterdam, The Netherlands, http://www.iospress.nl/loadtop/load.php?isbn=18724981, 2007. •	Referent for papers at the International Conference on Information Processing and Management of Uncertainty in Knowledge-based Systems, IPMU2004, Perugia, Italy;IEEE SOFA 2005 Arad-Szeged; WSEAS 2006 and 2007 Cavtat, Croatia; KCC 2006, Orlando, Florida; RASC 2006, Canterbury, SOFA 2007, Agricom 2007, INES 2008. •	She invited Professor Lotfi A. Zadeh from Berkeley University California in Romania and has organized the ceremony for the DrHC of Aurel Vlaicu University of Arad in 03.07.2003. •	She invited Prof. Michio Sugeno in Romania at "Aurel Vlaicu" University of Arad and has organised three seminars in November 2006. •	She co-organized the II, III si IV-th editions of the Summer School of Arad - with international participation, in English, at Arad and Moneasa in 2003, 2004, 2005 and 2006 by projects supported by the County Council Arad - the Culture Centre. •	She was reviewer for two papers in the review Information Fusion - Elsevier - Editor Belur Dasarathy in 2006, one paper for Neurocomputing in 2007, two papers for IEEE Transactions on Fuzzy Systems. •	Between 2005-2007 she made seven appreciations for PhD thesis in the field of Soft Computing. •	In 2006 she was nominated in one commission of doctoral thesis at Politehnica University of Timisoara. •	She collaborated at two grants CNCSU code 107 type B of the University Politehnica from Bucuresti, visiting two times the Laboratory LAMII of Universite de Savoie, Annecy, France (Prof. Laurent Foulloy and Sylvie Galichet) in 1999 and 2001. •	She is coordinating the Automate and Industrial Software dpt. of the Engineering Faculty of Aurel Vlaicu University of Arad.  V. E. Balas, L. C. Jain. knowledge for sensors and estimators by models and internal models. Journal of Intelligent and Fuzzy Systems, Volume 21, Number 1-2 / 2010, pp. 79-88, 2010.  Marius M. Balas, Valentina E. Balas. Adaptive Rule-Based Reasoning by Qualitative Analysis. In E. Hullermeier, R. Kruse, F. Hoffman (Eds. ) (eds. ), 13 International Conference on Information Processing and Management of Uncertainty, IPMU 2010, Dortmund, Germany, June 28- July 2, Proceedings, Part I, Communications in Computer and Information Science, Volume 80, Part 3, Part 11, pp. 553-560. Springer-Verlag, Berlin –Heidelberg , 2010.  Marius C. Popescu, Valentina E. Balas, Marius M. Balas, Onisifor Olaru. Algorithm for Virtual Reality. In ISCIII’09 Proceedings, 4th International Symposium on Computational Intelligence and Intelligent Informatics, 21-25 October 2009, Egypt, pp. 125-128. IEEE Catalog Number: CFP0936C-CDR, ISBN: 978-1-4244-5382-5, Library of Congress: 2009909581, 2009.  Marius C. Popescu, Valentina E. Balas, Sanda V. Musca, Dragos Cosma. Modeling the Phenomenon of Refrishing Air Inside the Spaces of the Fungi’s Culture. In ISCIII’09 Proceedings, 4th International Symposium on Computational Intelligence and Intelligent Informatics, 21-25 October 2009, Egypt, pp. 85-92. IEEE Catalog Number: CFP0936C-CDR, ISBN: 978-1-4244-5382-5, Library of Congress: 2009909581, 2009.  Dana V. Balas-Timar, Valentina E. Balas. Ability Estimation in CAT with Fuzzy Logic. In ISCIII’09 Proceedings, 4th International Symposium on Computational Intelligence and Intelligent Informatics, 21-25 October 2009, Egypt, pp. 55-62. IEEE Catalog Number: CFP0936C-CDR, ISBN: 978-1-4244-5382-5, Library of Congress: 2009909581, 2009.  Balas, V. E.; Ceregan, V.; Codrean, A.; Dragomir, T. L. Extension of a control structure with PSAIC. In Soft Computing Applications, 2009. SOFA ' 09. 3rd International Workshop on, pp. 83-86. IEEE Xplore Digital Library, 2009.  Popescu, Marius-Constantin; Balas, Valentina; Popescu, Liliana. Heating monitored and optimal control of electric drives. In Soft Computing Applications, 2009. SOFA ' 09. 3rd International Workshop on, pp. 151-156. IEEE Xplore Digital Library, 2009.  Roopaei, M.; Balas, Valentina Emilia. Adaptive gain sliding mode control in uncertain MIMO systems. Soft Computing Applications, 2009. SOFA ' 09. 3rd International Workshop on, pp. 77 - 82 , 2009.  Popescu, Marius-Constantin; Balas, Valentina; Popescu, Liliana. System decentralized for tracking control and data acquisition using for hydroelectric central. In Soft Computing Applications, 2009. SOFA ' 09. 3rd International Workshop on, pp. 157 - 162 . IEEE Xplore Digital Library, 2009.  M. M. Balas, Valentina E. Balas . Postmodernism and Control Engineering. In Seising, Rudolf (eds. ), Studies in Fuzziness and Soft Computing; Views on Fuzzy Sets and Systems from Different Perspective. Philosophy, Logic; Criticism and Applications, Vol. 243, pp. 377-390. Springer, 2009.  Noroozi, N. Roopaei, M. Balas, V. E. Tsung-Chih Lin . Observer-based adaptive variable structure control and synchronization of unknown chaotic systems. In IEEE Xplore Digital Library (ed. ), Applied Computational Intelligence and Informatics, 2009. SACI ' 09. 5th International Symposium on Applied Computational Intelligence and Informatics, ISBN: 978-1-4244-4477-9, pp. 71-76. 2009.  Valentina E. Balas, Marius M. Balas. On the Switching Control . AIP Conference Proceedings, Volume 1117, American Institute of Physics, pp. 81-88, 2009.  Marius M. Balas, Valentina E. Balas. Monoscopic CCD Cameras as Distance Sensors . In AIP Conference Proceedings , Volume 1117 , pp. 67-73 . American Institute of Physics , 2009.  Balas M. M., Balas V. E. . The Fuzzy Interpolative Control for Passive Greenhouses . In Horia-Nicolai Teodorescu, Junzo Watada, Lakhmi C. Jain (eds. ), : INTELLIGENT SYSTEMS AND TECHNOLOGIES: METHODS AND APPLICATIONS Book Series: Studies in Computational Intelligence , Volume: 217 , pp. 219-231. Springer, 2009.  M. M. Balas, V. E. Balas. World Knowledge for Control Application by Fuzzy-Interpolative Systems. Int. J. of Computers, Communications & Control, Vol. III , pp. 28-32, 2008.  V. E. Balas, M. M. Balas. Constant Time to Collision Platoons. Int. J. of Computers, Communications & Control, Vol. III, pp. 33-39, 2008.  V. E. Balas, M. M. Balas. Traffic Management by Constant Time to Collision. In Ignac Lovrek, Robert J. Howlett and Lakhmi C. Jain (eds. ), Knowledge-Based Intelligent Information and Engineering Systems, Lecture Notes in Computer Science, p. 658–663. Springer, 2008.  V. E. Balas, E. Roventa, T. Spircu. Fusion devices and changes of belief. Journal of Intelligent and Fuzzy Systems, Volume 19, Number 1 / 2008, pp. 9-18, 2008.  Balas, Marius M.; Balas, Valentina E. . World Knowledge for Control Applications. In 11th International Conference on Intelligent Engineering Systems, June 29 2007-July 1 2007, IEEE Xplore Digital Library, pp. 225-228. 2007.  Timar, D. B.; Balas, V. E.; . Decision-Making in Human Resources Selection Methodology. In Soft Computing Applications, SOFA 2007. 2nd International Workshop, 21-23 Aug. 2007, pp. 123-127. IEEE Xplore Digital Library, 2007.  Balas, M. M. Balas, V. E. Duplaix, J. . On the Switching Controllers' Issue. In Soft Computing Applications, SOFA 2007. 2nd International Workshop 21-23 Aug. 2007, pp. 103 - 108. IEEE Xplore Digital Library, 2007.  Balas, M. M.; Balas, V. E.; Duplaix, J.; . Optimizing the Distance-Gap between Cars by Constant Time to Collision Planning. In Industrial Electronics, 2007. ISIE 2007. IEEE International Symposium on, pp. 304 - 309. 2007.  Balas, V. E., Balas, M. M. . Driver assisting by inverse time to collision. In 2006 World Automation Congress, WAC' 06, art. no. 4259975. IEEE Xplore Digital Library, 2007.  Balas, M. M., Balas, V. E. . Some observations on stability of the switching adaptive rule bases of the fuzzy self-adapted interpolative controllers. In 2007 ISCIII' 07: 3rd International Symposium on Computational Intelligence and Intelligent Informatics; Proceedings, art. no. 4218396, pp. pp. 63-66. IEEE Xplore Digital Library, 2007.  Balas, V. E., Balas, M. M. . Switching adaptive correctors for fuzzy fusion self-adapted interpolative controllers. In 2007 ISCIII' 07: 3rd International Symposium on Computational Intelligence and Intelligent Informatics; Proceedings, art. no. 4218397, pp. pp. 67-72. IEEE Xplore Digital Library, 2007.  Filip, I. , Prostean, O., Szeidert, I., Balas, V, Prostean, G. . Comparative study regarding an adaptive fuzzy controller and a self-tuning controller with application to the excitation control of a synchronous generator. WSEAS Transactions on Systems, Volume 5, Issue 7, July 2006, p. Pages 1587, 2006.  Balas, M. M., Balas, V. E. . Optimizing the distance-gap between cars by fuzzy-interpolative control with time to collision planning. In 2006 IEEE International Conference on Mechatronics, ICM, art. no. 4018362, pp. pp. 215-21. IEEE Xplore Digital Library, 2006.  Balas, M. M., Balas, V. E., Balas-Timar, D. V., Szantho, L. R. . The fuzzy-interpolative methodology in soft computing. WSEAS Transactions on Information Science and Applications 3 (9), pp. pp. 1625-1, 2006.  Balas, V. E., Balas, M. M. . Observing control systems by phase trajectories of the error. WSEAS Transactions on Systems 5 (7), pp. pp. 1717-, 2006.  Balas, M. M., Balas, V. E., Barna, C. . The constant effort imposed distance braking for urban railway vehicles. In EUROCON 2005 - The International Conference on Computer as a Tool I, art. no. 1629937, pp. pp. 365-36. IEEE Xplore Digital Library, 2005.  Precup, R. -E., Preitl, S., Balas, M., Balas, V. . Fuzzy controllers for tire slip control in anti-lock braking systems. In IEEE International Conference on Fuzzy Systems 3, pp. pp. 1317-1. IEEE Xplore Digital Library, 2004.  Balas, M., Balas, V., Bocii, L. S., Radu, I., Koles, I. . The real-time evaluation of the weariness of the disk brake. In Proceedings of the Mini Conference on Vehicle System Dynamics, Identification and Anomalies, pp. pp. 241-24. 2002.  Balas, V., Balas, M. . The real-time estimation of the adherence by internal model. In Proceedings of the Mini Conference on Vehicle System Dynamics, Identification and Anomalies, pp. pp. 247-25. IEEE Xplore Digital Library, 2002.